On the boys’ side of things, Carson McEvoy, Keegan Brooks, Alec Brooks, Matt Fournier, Colin Frohlich, Colin Harris, Lawson Dunford and Jake Butler all repped for the Patriots at States this winter, with McEvoy turning in a 15th-place finish in the Slalom and an 18th-place finish in the Giant Slalom. Sydney Garcia and Hannah Biron repped for the Patriots at States; both girls finished middle-of-the-pack in both the Slalom and Giant Slalom. Ryan Deschenes’s boys, powered by a standout group of seniors, battled to 12-6 through the regular season, good enough for the No. 4 seed come tourney time. G-NG kicked off the winter with a fiery battle – one they eventually won, but not by much – vs. a determined Lake Region squad. Many of their games, in fact, would end up being close – their key midseason win over Wells, for instance, and both of their wins over Yarmouth. When the bracketing rolled around, the Patriots sailed through the prelims on a bye, then rolled past No. 5 Spruce Mountain 45-34 in the quarters. In the semis, though, G-NG locked horns with the Warriors a second time – and faltered. Wells emerged from that contest the victors, 49-37, and the Patriots retired till next winter. This year’s Patriots were a seasoned squad. Six seniors dotted the roster: Zack Pomerleau, Wyatt Edwards, John Martin, Connor Myatt, Ryan Lachance and Hunter Colby. Their departure – and Martin’s especially – will be a blow to the program. Still, a number of talented hard-workers will return next winter, and the team should make another solid run. Mike Andreasen’s girls made the winter look pretty easy: The Lady Patriots cruised to a 20-2 record and their second state title in three years. The team’s only two losses came against Class A superpower Greely, and both of those were close (53-45 and 53-48). In the playoffs, first-place G-NG naturally had a bye through the prelims, then murdered No. 9 Maranacook 61-27 in the quarters. The team dispatched No. 5 Wells in the semis and No. 3 Freeport in the Regional Final by healthy margins (48-34 and 42-31) before doing the same to North Reps MDI in the State Championship, 43-30. A quintet of seniors say goodbye to the team: Mikaela Ryan, Whitney Dwyer, Alexa Thayer, star Bri Jordan and Chelsea Davis; all five will be sorely missed. G-NG, though, has a reputation for being consistently tough, and can be expected to play a ferocious season next year. For one, standout Jordan Grant will be back on the court for her senior stretch. Melissa Burilla’s girls put together an excellent competition season. The team claimed second at WMCs, fourth at Regionals and seventh at States. A mere three seniors leave the squad behind after this year: Emily Fitz, Shawna Henry and Taylor MacLean. This winter’s huge crop of underclassmen – five sophomores and seven freshmen – ensure the team will look sharp again in 2019-20. Joe Hutchinson’s boys (a co-op with Leavitt, Oak Hill and Poland) opened an excellent season with a 3-3, OT tie vs. Mt. Ararat/Lisbon/Morse/Hyde. They then won 5-1 vs. Maranacook/Winthrop/Madison/Spruce Mountain, before losing 4-1 to Cape Elizabeth. The Kings bounced back and forth between wins and losses as the season progressed, but picked up more of the former than the latter, finishing as the four-seed in B South at 11-6-1. In the first round of the playoffs, the Kings welcomed to No. 5 Gorham; the Rams emerged victorious from that bout 4-2, thus retiring their hosts. The Gentlemen Patriots finished eighth at WMCs and 28th at States. The team’s shot-putters played a key role: Sebastian Leighton, Tyler Amos and Max MacCallum all finished top-10 in the junior division at WMCs, while Kaleb Frey and Kyle Curtis did likewise in the senior division. Meanwhile, Scott Lynch and Hunter Brown looked strong in the sprints, and Jake MacCallum in the hurdles. Brown, Nate Gendreau and Frey all finished top-10 in the Triple Jump. Frey took seventh at States in the Shot Put. The Lady Patriots finished fifth at WMCs and 15th at States. Their venerable Shot Put tradition continued to look strong, especially at the junior level, where Zoe Barnes, Madison Soule, Kassidy Plummer and Caitlyn Smith all finished in the WMCs top-10. At the senior level, Megan Reynolds, Madison Post and Melany Rendon also finished in the WMCs top-10. Barnes and Post both placed top-10 at States as well, and Reynolds finished in 11th. Michael Sutherland, Will Maines, Cam Bolduc and Mike Sweeney repped for the Gentlemen Patriots at States, with Sutherland turning in the team’s best performances. Jeff Duquette and Sheila Myhaver’s contingent put together an outstanding season: The Patriots went undefeated through the regular season – that’s an 8-0 record – to earn the tournament one-seed and a bye through the prelims. However, when the team reached the quarters, where they faced off with No. 8 Morse, they stumbled. The Shipbuilders got the better of G-NG, who thus retired till next winter. 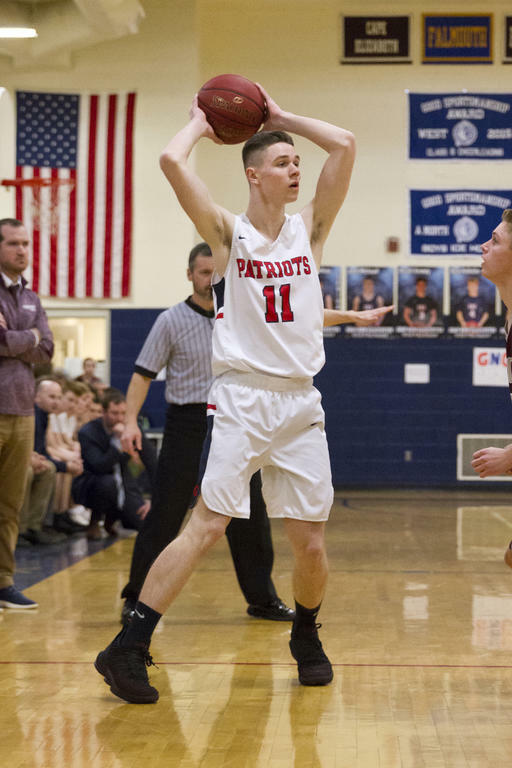 Nine seniors dotted the Patriots’ roster this year: Players Trevor Morin, Ryan Verrill, Austin Andrews, Andrew Parker, Blake Waterhouse, Vitaliy Chan and Mark Buzzell, and helpers Nick McCann and Cam Andrews. Wyatt Edwards is one of several critical seniors saying goodbye to the Patriots. Alexa Thayer – one of five G-NG seniors this winter – shows her stuff in the State Final.